On 21 Jan 2017, the White House called a press conference where the press secretary accused the media of "deliberately false reporting" on two issues of which the number of people attending President Trump's inauguration was one. The inauguration took place in Washington DC. 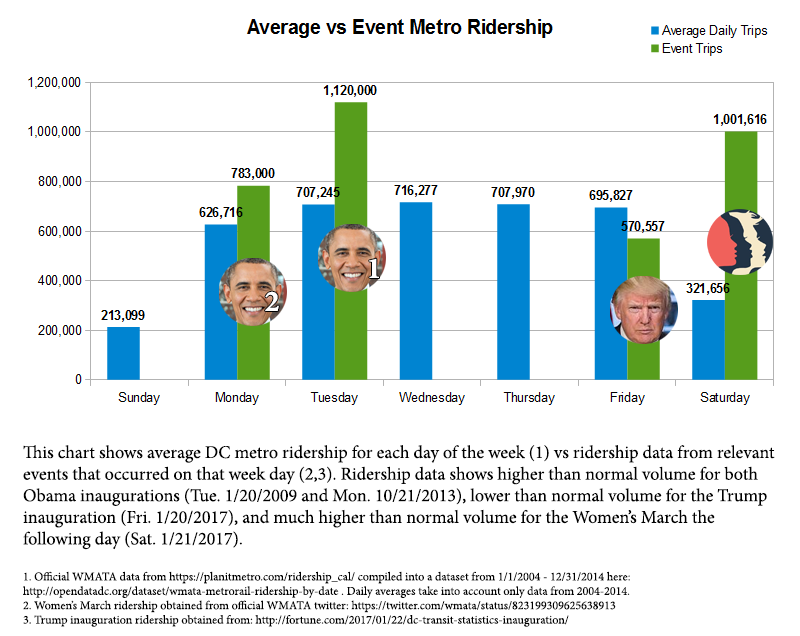 The number of people using the Washington DC transit system on the day of the inauguration was one of the pieces of evidence which the press secretary used to support his assertion that the inauguration had had a greater attendance than the previous inauguration and that the media was deliberately misleading the public by reporting otherwise. We know that 420,000 people used the D.C. Metro public transit yesterday, which actually compares to 317,000 that used it for President Obama's last inaugural. More people used Metro on Obama's second inaugural than on Trump's first. Spicer was comparing second Obama inaugural 11 am ridership (317,000) with Trump's full-day ridership (570,500). Trump's 11 am ridership was about 193,000. The 11 am ridership numbers were tweeted by Metro. CNN has confirmed Wash Po numbers from Metro on full inaugural day ridership. For Trump: 570.5k. Obama '09: 1.1m. Obama '13: 782k. Here is the link to Metro's official twitter account. Note that there was almost twice as much traffic on Saturday (Women's March on Washington) as on Friday (inauguration and a regular workday for many). Comparable numbers are not being used in the press briefing statement. The 420,000 number can not be compared to the 317,000 number. The 317,000 number in the OP is correct for ridership up to 11AM 21 January 2013. Metro reports that 797,787 rides were taken on the rail system Monday. This is significantly lower than the 1.1 million trips taken on inauguration day in 2009. It’s tough to compare Monday with any other day, owing to the combination of inauguration and holiday, but Metrorail’s average weekday ridership was north of 723,000 in September (the most recent data available). Also, keep in mind that "rides" does not mean people. When you go home, that is a second "ride". Did the White House fabricate an Iranian attack on the American Navy?